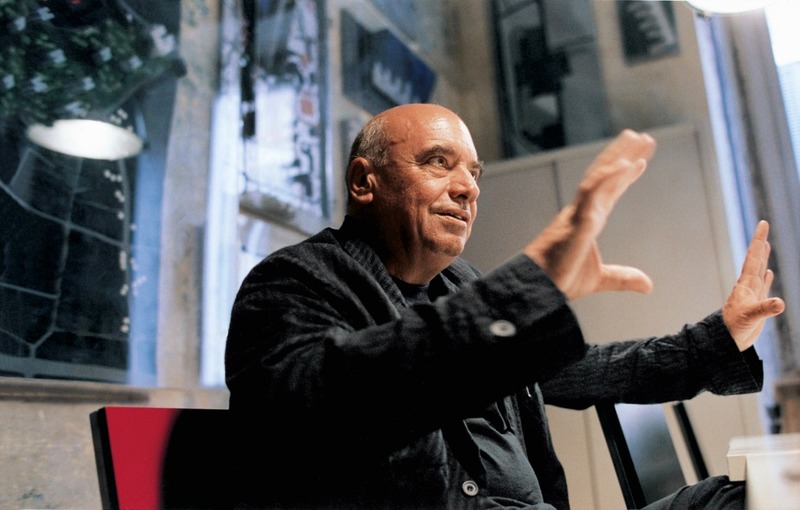 There aren’t many living architects with such an impressive roster of international design feats like architect Massimiliano Fuksas. 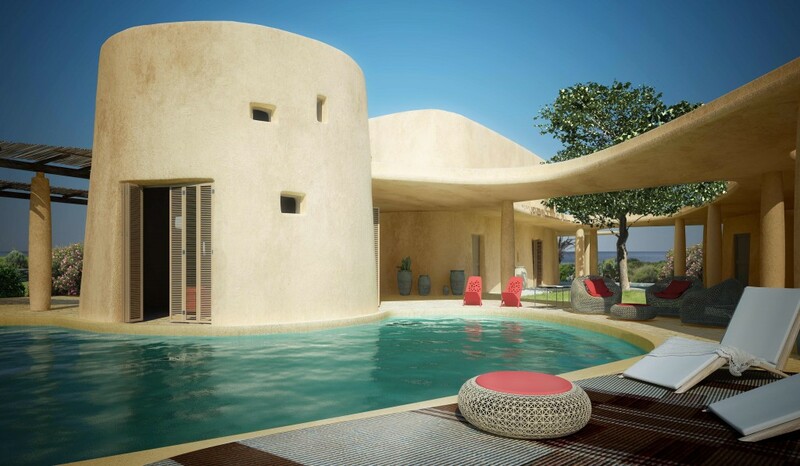 His architectural vision can be glimpsed in cities all over the world – from Marseille to Bratislava to Los Angeles. In 2013, Fuksas wowed the world when his concept for the Shenzhen Bao’an International Airport-Terminal 3 was finally realized; the design is a symbolic blend of the elements, simultaneously evocative of both wind and water, while featuring organic shapes found in nature, such as the honeycomb “skin” motif that lines the interior and exterior of the terminal. Since then it has been a whirlwind of impressive projects, including the new Musical Hall and Exhibition Hall in Tbilisi, Georgia, which is made up of two tubular, organ-like structures that loosely resemble valves in the human heart. So it’s no surprise one of Fuksas’ latest designs in his native Italy is also consciously rooted in organic, elemental, and earth-based forms. 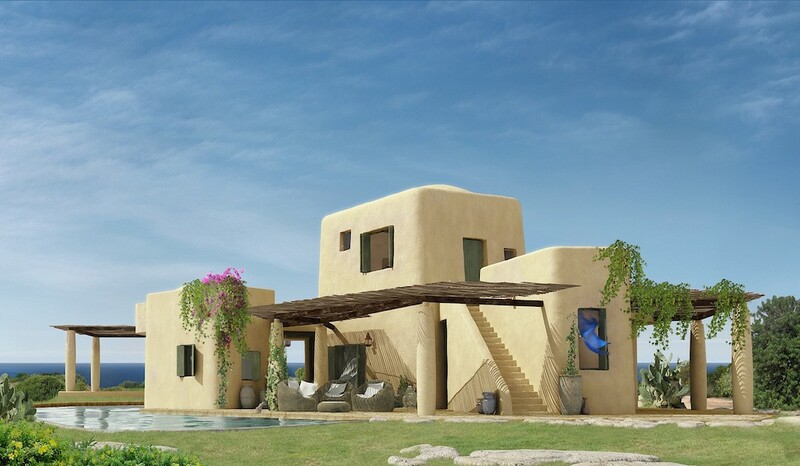 Located on Sardinia, a small island between France and Italy, Is Molas is a new eco-friendly resort community that features open-concept, organically-designed villas. We spoke to Fuksas about the inspiration behind the project, what it’s like to work together with his wife Doriana Fuksas (who designed the villa interiors), and some of the greatest challenges facing 21st-century architects. Why Sardinia, Italy? Is there anything about this island that is particularly special to you? My best memories come from the heart of Sardinia. Maybe it was because of my young age or because it was a wonderful period [where I was] in the search of my own freedom. I love all the materials coming from Sardinia. Any Sardinian inhabitant is [capable of] expressing the highest levels of poetry. It seems to me that Is Molas is very consciously connected to nature and intentionally incorporates the surrounding environment, especially with the use of local vegetation. How important is the integration of nature in your designs? Does this intentionality shift when designing projects for a large metropolis? Everybody should [be conscious] of saving energy and showing respect for the environment. It should be the basis for every architectural project. Considering the context of this project, in particular, it [seemed fitting] to incorporate nature into the design in the way that we did. How did the indigenous Nuragic civilization inspire this project? We were inspired by nuraghes. These [ancient] structures have been eroded by wind and other atmospheric agents to the point that they blend with the surrounding landscape in such a way that it’s almost difficult to distinguish them from the eroded topography. In the same way this visual suggestion affected us, we wanted to create something that was like a meteorite, a rock, a piece of nature. [We wanted] to build shapes that belong to the area. Why is this project considered an “experimental project”? This project is very different from our previous ones. 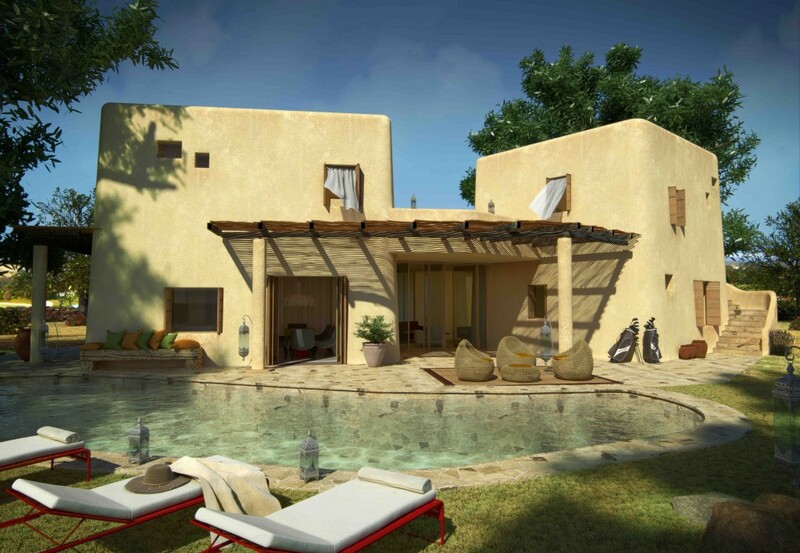 It’s more “organic.” We used natural materials and finishings such as tadelakt (a waterproof lime plaster used in Morocco) and cocciopesto (fragments of earthenware used in ancient Roman architecture) to make sure the structures were warm in winter and cool in summer. You’ve said that these villas are “inhabited sculptures,” and that they “surpass the box, the cage, or the enclosure.” Can you elaborate a little on that? We always thought of these buildings as inhabited sculptures. It is more an echo of the Nuragic culture. The buildings are inserted into the landscape and evoke a discreet and environmentally intelligent architecture that blends harmoniously with the local landscape. But I also imagined [these designs as representative of] a new planet: it’s about free time and living a different life. The villas have small windows and darker interiors on one side. Inside you feel protection. One the other side there’s large glass and smaller windows. 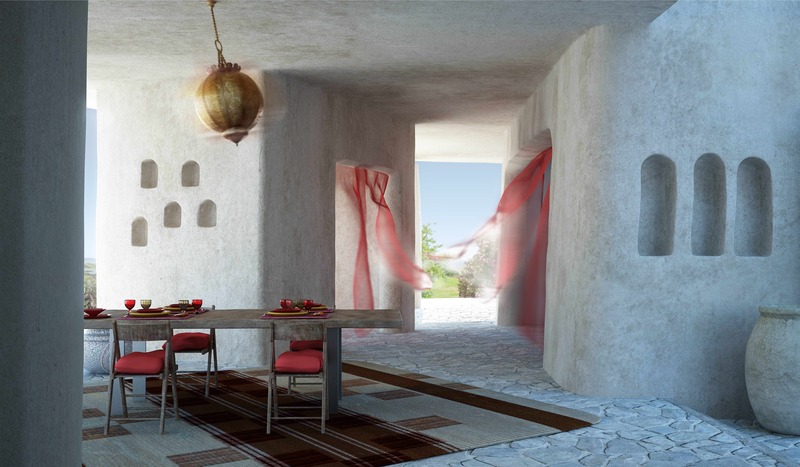 How do the interior designs (by your wife, Doriana) also evoke the natural, surrounding elements of Sardinia? In an architectural design such as Is Molas, with its handcrafted appearance, we could not think about using furniture pieces that were conceived for other architectures. This [process of design] is the last love act that an architect does for his architecture. We wanted to remember the handmade Sardinian craftsmanship, with its fluid forms and natural color. Designs that born to stay between the limpid sky and the azure sea. Designs that evoke sunsets on the beach, rock, and a landscape of figs, myrtles and rosemary. What is it like working with your wife on a project? How do the two of you balance each other out in the creative/executive processes? Can you describe your working energy and how it may lead to synergy? I’ve worked with my wife Doriana Fuksas since 1981. Maybe we’re complementary. We love the same things, the same feelings and moods, just in a different way. Work is quite the life, and so the professional and private merges together and you can’t separate them. So, you just share the two worlds. What is your most exciting “realized” architectural design to date? It is difficult to choose. If I have to choose one I’d say the Peres Peace Center in Jaffa Tel Aviv. You seem to have so many ongoing projects! How do you manage to juggle it all at once? I always have, so I don’t even ask myself how anymore. Where do you gain inspiration? The ideas come into my mind in the very early morning between 6 and 6:30am, in that state between sleep and wakefulness. I can get inspiration everywhere and from everything. What are some of the greatest challenges of being an architect in the 21st century? Architecture should improve people’s lives, particularly those of harried city-dwellers. Building should not only solve practical problems, but also conjure emotions. The architect has a responsibility because what he builds is meant to stay on the earth for quite a while. This responsibility engages us with civil society because it’s helpless to realize something beautiful if it does not take in consideration the needs of the user. We have to be radical in our choices, but our ultimate client is the human being.